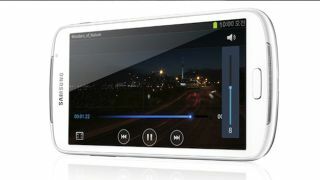 Samsung has unveiled the latest addition to its Galaxy Player line up with a new 5.8-inch model. The Galaxy Player 5.8 PMP, which aims to rival the Apple iPod touch, arrives with a look and feel very similar to the blockbuster Galaxy S3 smartphone launched earlier this year. The key differences, of course, are the lack of cellular capabilities and the size of the screen. The whopping 5.8-inch display boasts a resolution up 960x540. The iPod touch boasts a much smaller 3.5 Retina Display, so that all-important pixel density is much lower on Sammy's new device. Naturally there's Wi-Fi, Bluetooth, and a front-facing VGA camera for video calls. Unfortunately there's no rear camera, something which gives Apple's player another leg up on the competition. Pricing or availability has not yet been announced, but we'd expect this news at the IFA tech fest in Berlin, which commences on August 31.